The Yale brand is part of the massive Columbus McKinnon group. Yale is constantly looking at new ways to improve their own brand Yale products in particular the Yale electric hoist systems using innovative technology and is consistently raising the safety benchmark. Yale electric hoists are one of the market leaders and offer excellent proven reliability. Lifting Hoists Direct has had an excellent relationship with Yale UK for many years. In fact we have won the distributor of the year award twice now. This allows us to offer very competitively priced Yale electric hoists with fast delivery. We can also offer spare parts, servicing and inspections on all Yale electric hoist systems. Yale electric hoist systems can be found in use across a vast range of industries. From the smallest of workshops to the largest of factories and everywhere in between. There are model ranges available to suit many different lifting applications. Make Yale electric chain hoists your go-to brand for quality, reliability, robustness and cost effectiveness. You won’t be disappointed with a Yale hoist. Take a closer look at our model pages to see comprehensive information about each Yale hoist, call our sales team for a quick, competitive quotation, or contact us by email here. 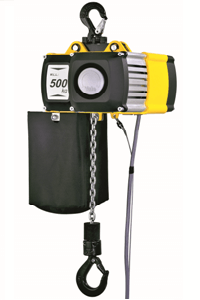 A Yale hoist is immediately recognisable with its bright yellow colour. There are a range of Yale electric hoist models with innovative designs. If used in accordance with the Yale hoist classification, and maintained well, you can expect to get around ten years of operating time from a Yale electric chain hoist. 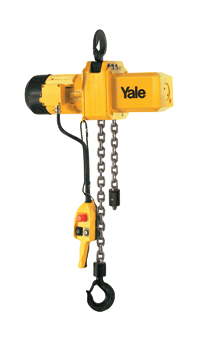 Yale electric chain hoists are available in a wide range of lifting capacities. From the smallest at 125kg and the largest at 10000kg there is a Yale hoist to suit the majority of mainstream applications. 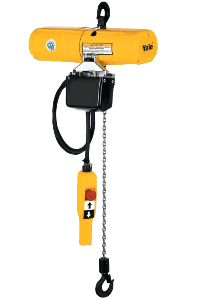 These powered Yale chain hoist systems are also available in a range of power options. The two smaller models having 110v, 230v & 400v options and the two largest models are available in 400v only. 110 & 230v are for single phase supply and 400v is for 3 phase supply. Limit switches for the upper and lower hook position can greatly improve the working life of the slip clutch, motor and gearbox. 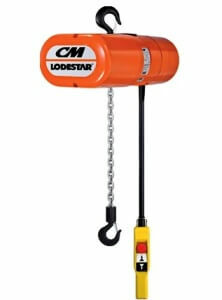 Model Yale CPV/F and the Lodestar hoist incorporates upper and lower limiters as standard. The Yale CPE models can have them fitted as an optional extra at the time of ordering. The CPS model does not have any limit switches, due to its lower capacity ratings and is intended for lighter use, so relies on the slip clutch. Yale electric hoists come with many safety features so you can be assured of optimum safety with each use. Some Yale hoist devices come with thermal overload protection as standard, including the CPS and the CPE. The CPV/F and Lodestar models have overload protection available as an optional extra. The pendant type operating controllers are fully encapsulated and are all protected to IP65. The IP65 rating means the electrics within are fully protected from dust, dirt and water ingress. Some Yale electric hoist models incorporate slip clutches to provide overload protection and most incorporate spring pressure brake systems. These are designed to enable a load to be held firmly, even in the event of a power failure. Yale hoists comply with all the latest national and international regulations so you can be sure of a quality and safe electric hoist with each Yale purchase from Lifting Hoists Direct.